A pest has been ravishing through Alabama causing devastation on several farms. Extension entomologist for the Alabama Cooperative Extension System, Ayanava Majumdar, says although yellowmargined leaf beetle is not a new pest, it has made a comeback. Yellowmargined leaf beetles are invasive pests hailing from South America. They entered the United States in the 1940s. Now, Majumdar says he still receives numerous calls about the leaf beetles being in growers’ production systems. The yellowmargined leaf beetle gets its name from the yellow margins on the wings of an adult. 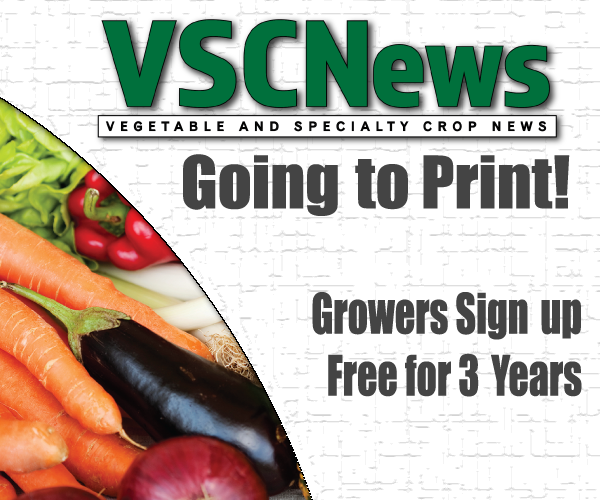 The pests are mostly attracted to turnips, napa cabbage and other brassicas. These leaf beetles gather in large numbers and enjoy the cold weather. They will rapidly destroy an entire field if they are not controlled in a timely manner. Yellowmargined leaf beetles can be difficult to identify with an untrained eye. Their feeding patterns are similar to caterpillars, and they are commonly mistaken for lady beetles, which are beneficial insects. 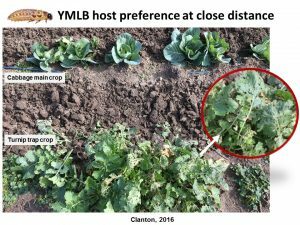 To ensure the grower is spraying for the correct pest, proper identification is extremely important when trying to control yellowmargined leaf beetles. Because their eggs and larvae look similar, yellowmargined leaf beetles can be mistaken with lady beetles. The eggs are orange-like and elongated, and leaf beetle larvae resemble lady beetle larvae. However, Majumdar says there are a few differences between the leaf beetle and the lady beetle. Leaf beetle eggs are laid loosely around the base of the plant, unlike lady beetle eggs. Furthermore, leaf beetle eggs can be found in the cracks of the soil. “The adult (leaf) beetle will go down in the soil, follow the root and lay eggs deep in the soil,” says Majumdar. Although leaf beetle larvae may look like lady beetle larvae, they do show slight differences. Majumdar says the lady beetle has spines while the leaf beetle does not. This difference may be difficult to spot, so the grower needs to look closely. Secondly, leaf beetle larvae will typically feed in masses, unlike lady beetle larvae. If a grower sees these masses, it is a good indication of leaf beetles that need to be controlled. Majumdar says the best time to control leaf beetles is when the plants are small. Once the plants grow bigger, the leaf beetle populations grow as well, making it tougher to apply enough chemicals to control them. Majumdar warns growers about the challenge of controlling leaf beetles on cabbage. Because the head of the cabbage is protected by leaves, it is difficult to get pesticides where they need to be. Moreover, Majumdar says once the grower gets control of the adult leaf beetles, they might see the leaf beetle cadavers in the heads of the cabbage. This becomes a nuisance because then the grower must thoroughly wash the cabbage before it can be sold. 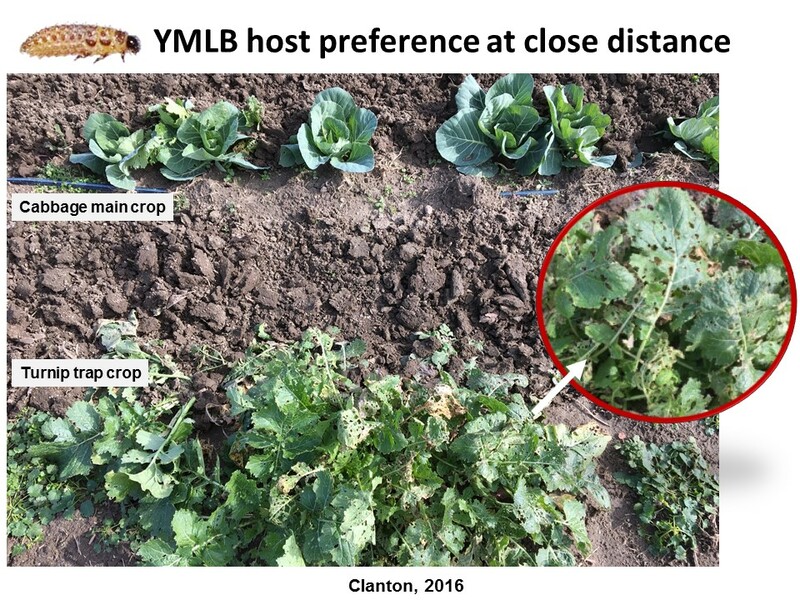 For organic production systems, Majumdar suggests trap crops for leaf beetle control. Majumdar adds that growers should not overlook the advantages of beneficial insects. Spined soldier bugs and lacewings are natural predators of yellowmargined leaf beetles and should not be forgotten when considering control strategies. “You need to be careful in conserving natural enemies,” Majumdar warns. Proper identification and immediate control is incredibly important when dealing with yellowmargined leaf beetles. The pest is quick-moving and can cause major devastation. 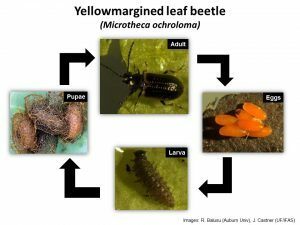 For more information on yellowmargined leaf beetles, visit the Alabama Vegetable IPM website. Majumdar also recommends growers connect with their local Extension agents for additional questions or chemical recommendations.